"She will not make it," her mother said earlier. "She's brain-dead and has nothing — no life left in her." GREAT MILLS, Md. — The teenage girl who was shot by an ex-boyfriend inside their Maryland high school died late Thursday after she was removed from life support, the sheriff's office said Friday. Jaelyn Willey died at 11:34 p.m. ET just hours after her mother said the 16-year-old was brain dead and that there was "no life left in her." "My daughter was hurt by a boy who shot her in the head ... and took everything from our lives, " Melissa Willey said at a news conference. "She will not make it." Willey was one of nine, the second oldest child, and was a member of her school's swim team, her mother said. Rollins died afterward after trading shots with a school resource officer who got there within a minute. It’s not yet clear whether Rollins was killed by the officer’s bullet or took his own life. Willey had been in critical condition at the University of Maryland Prince George’s Hospital Center. A fundraising page to help her family has raised nearly $78,000. 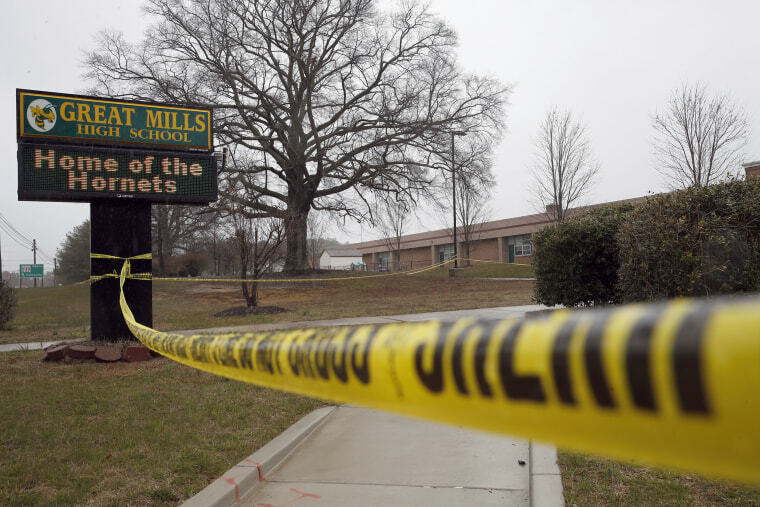 Gaskill, a six-year veteran with SWAT team training, responded within a minute and fired his weapon simultaneously with a final shot fired by Rollins, Cameron said. The officer was unharmed. On Wednesday, investigators said the Glock handgun used in the shooting was legally owned by Rollins father. In Maryland it is illegal for anyone under age 21 to possess a handgun unless it is required for their employment.